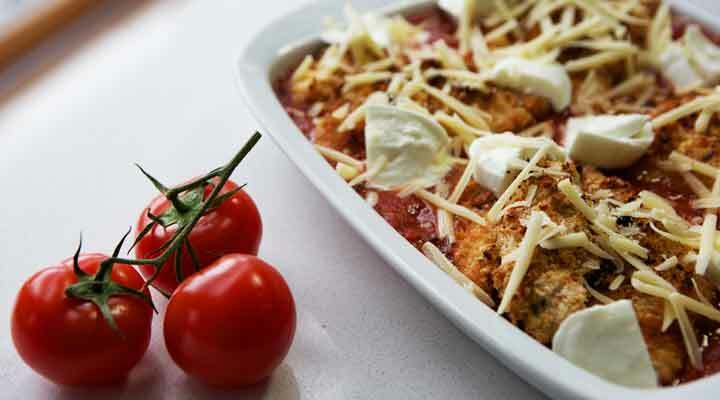 Siobhan Berry of MummyCooks.ie shares a delicious recipe for the whole family. A lovely colourful classic Italian recipe. Your kids will love it! Place the chicken breasts between cling film sheets and bash out with a rolling pin until they are nice and thin. Dip the chicken in the egg, then breadcrumbs, mixed with half the Parmesan. Set aside on a plate in the fridge while you make the sauce. Heat oil and cook garlic for 1 min, then add tomatoes, passata and oregano before allowing to simmer for 5-10 mins. Heat your grill to high and cook the chicken for 5 mins each side, then remove. Pour the tomato sauce into a shallow ovenproof dish and top with the chicken. Scatter over the mozzarella and remaining Parmesan and grill for 3-4 mins until the cheese has melted and the sauce is bubbling. Serve with pasta and enjoy!